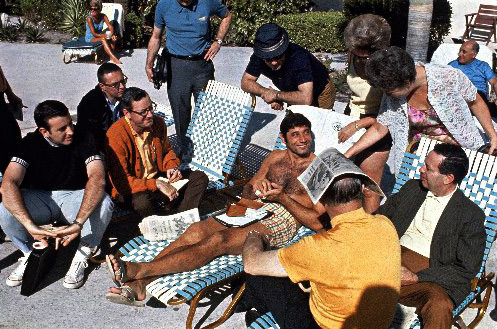 New York Jets QB Joe Namath sits casually on the beach with media and fans before Super Bowl III game vs Baltimore Colts in Ft. Lauderdale, FL on January 10, 1969. The award for best new entry in the photo night event sweepstakes has to go to Los Angeles's new Annenberg Space for Photography. The organization’s series of themed print shows linked to a series of photographers’ presentations is showing other galleries and educational institutions how it should be done. Opening in March 2009 with editorial photographs on the wall from a major photojournalism competition, the gallery brought a breathtaking array of photojournalists to their podium. Speakers included Steve McCurry, David Burnett, David Hume Kennerly, Carolyn Cole and Michael Robinson Chavez. McCurry even did a workshop. Now the gallery has a show of sports photography by iconic photographers Neil Leifer and Walter Iooss. Both made presentations during the show’s run. Before the show closes both (both!) Sports Illustrated Picture Editor Jimmy Colton (last week) and Director of Photography Steve Fine (March 11) will have made the trip West. And dear-to-our-hearts surfing and outdoor photographers get their due with visits by Art Brewer (January 21) and Jimmy Chin (February 18). Adding to the attraction of the mid-week Thursday night gatherings is the very affordable ticket price: free, via an on-line registration process. Why would anyone be anywhere else on a Thursday evening? Photographers in the West have to be over the moon with what the Annenberg has brought to their back yard. Unless students are within a subway ride of New York’s ICP, college photographers around the country must be having a great many V-8 moments: "Oh, man! I coulda gone to photo school in the West!"